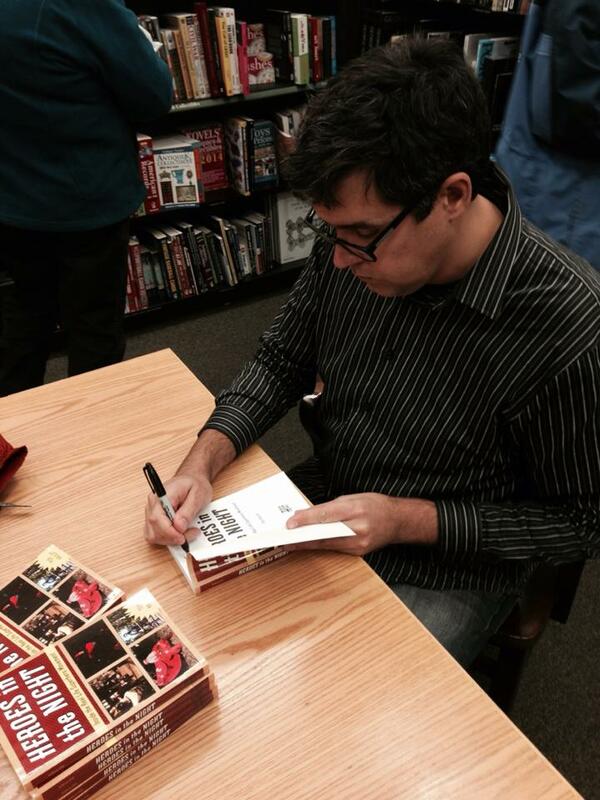 Signing copies of Heroes in the Night at Barnes & Noble. Feb.-May 2013: I moved down to Arcadia, Florida. While there, I worked on what will now be a future book (maybe my third?) and did some freelancing for publications like The Guardian and M magazine. Things did not work out for me in Florida and I moved home to Milwaukee in May. I have no regrets. It was just another one of my hundred lives. June 2013: Throughout the spring and summer I worked with my publisher on final edits of Heroes in the Night. They were pleased with the book and asked what I had in mind next. My initial idea was passed on (for now) but then I pitched the idea of doing a book that discussed the lives of paranormal investigators. They were into that idea, and the paperwork got signed in June. I immediately got to work. I made a connection with local group Paranormal Investigators of Milwaukee (PIM) and have been hanging out with them as much as I can since. July 2013: First travel for new book to Vermont for “Champ Camp,” hosted by Believe It Tour @ Lake Champlaign. August 2013: Me and David Beyer, Jr. set up a blog for our comic book collaboration, Ballyhoo. I wrote the script (a fiction set in a circus in 1955) and David has been working on the art. Progress on this project has been slow as we are both busy dudes. But page by page it is happening and David’s art looks absolutely amazing. Hopefully Ballyhoo will be rolling out issue one in 2014. October 2013: Oct. 1 was official release date for Heroes in the Night. How exciting! I had a great hometown reception at Boswell Book Company w/ after party at Stonefly Brewery. Good local press, including various bits in Shepherd Express, Onmilwaukee.com, Milwaukee Journal Sentinel, Milwaukee mag, and The Onion’s local A.V. Club (R.I.P.) I also made in-store appearances in Chicago (Quimby’s), Madison (Westfield Comics), and Saint Paul (Common Good Books, with good attendance due in part to a feature in the Minneapolis Star-Tribune.) Friends from around the country posted photos of them with the book at various bookstores around the country. Such a cool moment in my life. November 2013: Tabled at Milwaukee Zine Fest with my friends David Beyer, Jr., Lance Orr, and Michelle from Skill Shot MKE zine. I had a zine of goofy poetry I wrote titled Palookaville. This is currently being expanded from 16 to 36 pages and will be available as a chapbook/ e-book in 2014. Also did an event at Barnes & Noble in Brookfield Square. December 2013: Participated with Milwaukee Real Life Superheroes The Challengers at their annual Christmas charity toy drive. I’m now at about the halfway point for my paranormal book. I have accomplished a lot on it, but there is still a lot of work to go to get to the June 2014 deadline. I will be doing another trip, to Arizona this time, in February and have some other small trips and interviews and a lot of final drafting to do. I also have a couple side projects, we’ll see what happens with those. I could really use a team of unpaid interns right now! After I turn this book in, I’m not quite sure what my main focus will turn to, but I’ve got a couple of ideas. I’ll be reworking some old ideas and trying some new ones, too. A salute to 2013, and cheers to 2014! Posted on December 27, 2013, in Uncategorized and tagged Ballyhoo, heroes in the night, palookaville, paranormal, tea krulos. Bookmark the permalink. Leave a comment.